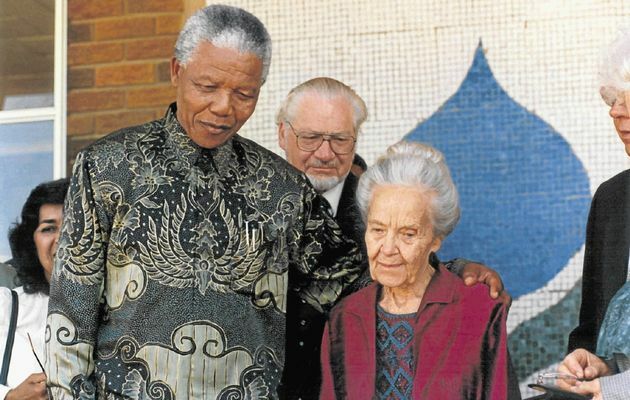 Nelson Mandela with Betsie Verwoerd – Hendrik Verwoerd’s widow – in Orania, a whites-only enclave in the Northern Cape. Imagine hugging the wife of a person who wanted to hang you – but instead got him jailed for 27 years instead! Verwoerd still strikes a raw nerve with many blacks. Shortly after Mr. Mandela took office, statues of Verwoerd disappeared from some government buildings and town squares. But Mr. Mandela was not to be deterred from his visit. “It is always better to sit down and talk,” he said. Nelson Mandela also invited his previous Jailers to his inauguration as the First Elected Black President of South Africa. I was also watching Al Jazeera TV of their Israeli Jew Correspondent who was banished by his own Mother ‘as not being my son!’ – because he had joined demonstrations in support of The Palestinians. I watch the images of massacre between fighting factions in in The Forgotten War in CAR – Central African Republic. We came to the world empty handed – and we will leave the world empty handed – Alexander The Great! I hear the ballistic war mongering language of Israeli Foreign Minister Weizman! Like Obama said – The situation in Israel is not sustainable – it will explode anytime! The only colonized people in the world! And in USA they are just now talking of New Restrictions and Embargoes against Iran. What is wrong with these peoples? Sad thing The Jews Zionists and their Supporters esp in USA and UK – will just drive people round the bend – and give Hitler even – said to say it – a ‘sort of good name’! Will Israel learn the language of peace to solve our worldly problems? Will we the Arabs also learn? Iraq, Syria … and so many other cases here!! Perhaps we could have saved Iraq – if there was a real meeting of the minds – and we were ready to talk with each other – and give peace a real chance! So many other lost chances and opportunities too – to take us to this mess now – all the calamities, decadence and malaise! India too with Pakistan – versus Kashmir. China Japan Korea – the list goes on and on! The world needs to wake up – before it is too late for mankind! Read also Mandela Dies Here! We need to follow Mandela’s footsteps – For Peace For Human Kind! The world needs to learn from Mandela! PBUH.